Florida Keys National Marine Sanctuary covers 2,896 square nautical miles (9,933 square kilometers) and is one of the largest marine protected areas in the United States. It spans a shallow-water interface between the Gulf of Mexico and the Atlantic Ocean, and is adjacent to most of the relatively shallow estuarine waters of south Florida, including those of Florida Bay and Biscayne Bay. The sanctuary surrounds more than 1,700 islands, which constitute most of the limestone island archipelago of the Florida Keys. This archipelago extends from the Florida peninsula south and westward over 220 miles (354 kilometers), terminating at the islands of Dry Tortugas National Park. Hawk Channel is located "ocean side," between the island chain and the extensive bank reef tract (about 5 miles offshore). The oceanic boundary of the sanctuary is the 300-foot isobath (~100 meter depth), beyond which the Florida Straits separate the Florida Keys from both Cuba and the Bahamas. The western tip of the Florida Keys sanctuary lies in an area of high diversity due to the presence of both tropical and subtropical species, with an intermingling of a tropical biota characteristic of the greater Caribbean and the warm-temperate biota of the Gulf of Mexico (Figure 1). Though the sanctuary surrounds much of the Florida Reef Tract, this subtropical region also sustains many other interdependent habitats including fringing mangroves, seagrass meadows, hard-bottom regions, and patch reefs. Together, this diverse set of habitats supports significant commercial and recreational activities including scuba diving, fishing, and other water-based tourism. This marine ecosystem supports more than 6,000 species of plants, fishes, and invertebrates, and also has the largest documented contiguous seagrass community in the northern hemisphere. The coral reefs and associated soft-sediment communities comprise one of the most unique and diverse assemblages of plants and animals in North America. The sanctuary is also home to maritime heritage resources that encompass a broad historical period from the European Colonial Period to the Modern Era. 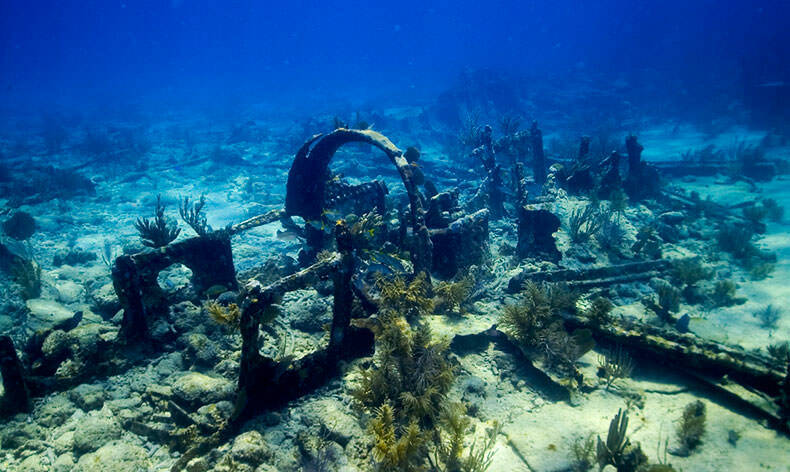 Because of the Keys' strategic location in early European shipping routes, the area's shipwrecks reflect the history of the entire period of discovery and colonization. The Florida Keys sanctuary has an extensive education and volunteer program focused on the protection of maritime heritage resources. Volunteers on the Submerged Cultural Resources Inventory Team have documented more than 400 underwater historical sites in the sanctuary. Approximately 1,680 square nautical miles (5,762 square kilometers), or 60%, of sanctuary waters are under Florida state jurisdiction, and numerous state and federal parks and reserves are located within the sanctuary's boundaries (NOAA 1996). The sanctuary is administered by theDepartment of Commerce's National Oceanic and Atmospheric Administration (NOAA) and is managed by both NOAA and the state of Florida's Board of Trustees of the Internal Improvement Trust Fund through the Florida Department of Environmental Protection (FDEP). The Florida Keys are a chain of limestone islands that extends from the southern tip of the Florida mainland southwest to the Dry Tortugas, a distance of approximately 220 miles (354 kilometers). The islands are the fossilized (lithified) remnants of ancient coral reefs and sand bars that flourished during a period of higher sea levels approximately 125,000 to 100,000 years ago during the last interglacial period of the Pleistocene epoch (Hoffmeister and Multer 1968, Shinn 1988, Lidz and Shinn 1991). Today those remnants are known as Key Largo Limestone and Miami Oolite, respectively. During this period of lower sea level, the Florida land mass was much larger than today, and the area now referred to as Florida Bay was forested. As glaciers and polar ice caps started melting 15,000 years ago, sea level rise and flooding of land combined with tidal influence to create the geography of the Keys and their surrounding areas. Florida Bay formed about 4,000 years ago, during a time when coral communities thrived along the entire seaward edge of the Keys. As sea level continued rising, tidal passes started forming, which facilitated the export of terrestrial material, sediments, and organic matter from both Florida and Biscayne Bays toward the Atlantic Ocean. In the Middle Keys in particular, tidal passes that formed allowed for inimical waters to flow offshore, resulting in conditions less favorable for coral reef development (Ginsburg and Shinn 1964, Shinn et al. 1989, Lidz and Shinn 1991, Shinn et al. 1994, Ogden et al. 1994). This is reflected, for example, in the sparse present-day distribution of patch reefs and offshore bank reefs between Alligator Light and Moser Channel (Seven Mile Bridge) (Marszalek et al. 1977). In the upper and lower Keys, ocean-side habitats were less influenced by these waters due to the size and orientation of the islands, so relatively vigorous coral reef growth continued (Lidz and Shinn 1991, Shinn et al. 1989). Thus, prior to human impacts in south Florida, water exchange between inshore and offshore environments significantly impeded coral reef (and seagrass) development in the same areas. Today, the Florida Keys outer reefs are a semi-continuous series of offshore bank reefs located at the northern zoogeographic boundary of tropical waters. They began forming between 6,000 to 10,000 years ago during the Holocene sea-level rise and all present-day bank reefs are located on pre-existing topographic highs in the Pleistocene bedrock (Shinn et al. 1977, 1989). Due to its location at the northern limit of coral reef development, Florida Keys reefs regularly experiences natural stresses such as winter temperatures below those normally associated with vigorous coral reef development (Roberts et al. 1982). Also, the reef system experiences higher summer temperature extremes than many other reefs in the Caribbean basin (Vaughn 1918, Kruczynski and McManus 2002). The Florida Keys sanctuary also includes the Florida Plateau, which extends 223 miles (360 kilometers) from Miami to the Dry Tortugas. This shelf forms part of the Florida-Bahamas carbonate province and is the only area in the continental U.S. where active carbonate deposition is occurring on a large scale (Enos 1977, Shinn et al. 1989). The Florida Plateau is bounded by the Florida Straits to the east and south and by the Gulf of Mexico to the west. South Florida is located at the convergence of the subtropical and temperate climate zones. Physical oceanographic processes in the Florida Keys region consist of oceanic currents, tides and wind-driven currents, along with upwelling along the outer reef tract (Enos 1977, Schomer and Drew 1982, Brooks 1990, Leichter et al. 1998, 2003). The physical environment of the Florida Straits is dominated by the Florida Current, a strong surface current originating in the South Atlantic and Caribbean Sea (Figure 2) (Lee et al. 1992, Lee and Smith 2002). The Florida Current is the convergence of the Yucatan Current and Gulf of Mexico Loop Current off peninsular Florida. The Florida Current is renamed the Gulf Stream System off the southeastern U.S. (Lee et al. 1992). The Florida Current transports warm water from the Caribbean and is the major reason for reef development and the occurrence of tropical marine biota in the Florida Keys (Jaap 1984). The Florida Current comes within 9 miles (15 kilometers) of the upper Florida Keys, but runs further offshore, around 50 miles (80 kilometers), off Key West. Differences in the proximity of the Florida Current to the Florida Keys seascape result in complex circulation patterns on the south Florida shelf (Lee et al. 1994). For example, eddies of 31 to 62 miles (50 to 100 kilometers) in diameter frequently form when meanders break free from the main axis of the Loop Current. 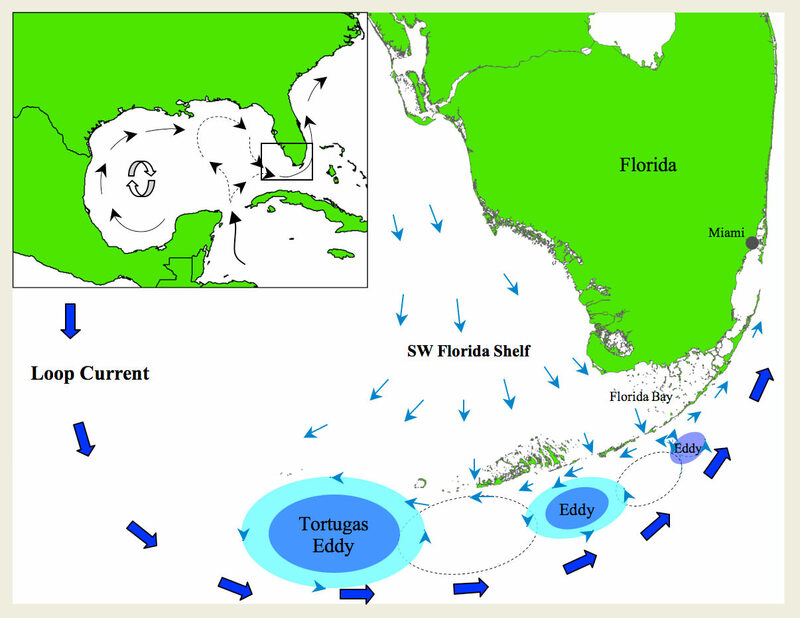 These eddies move into the Florida Straits and are trapped between the Florida Current to the south and the Dry Tortugas to the north. These "Tortugas gyres" can remain stationary for 50 to 140 days until they are pushed out by the arrival of the next gyre moving along the Loop Current. Once displaced, they are transformed into the smaller "Pourtales Gyre" by their movement downstream and the narrowing of the distance between the Florida Current and the Keys (Lee et al. 1994, Lee and Williams 1999). These gyres potentially contribute to the nutrient and larval transport between the Loop Current and the Florida Keys system, and may also serve to retain coastal-derived larvae that would otherwise be carried away by the Florida Current (Cowen et al. 2006, Sale 2006). On a more localized scale, tides and wind-driven currents are the dominant processes affecting circulation in the Florida Keys and Florida Bay (Schomer and Drew 1982). The Florida Keys and Florida Bay are micro-tidal environments (<3.3 feet or one meter); tidal exchange between Florida Bay and Hawk Channel mostly occurs in the middle Florida Keys, and to a lesser extent in the lower Florida Keys. From November to February, atmospheric cold fronts from the north supplement tidal flow out of Florida Bay (Smith 1994, Smith and Lee 2003). Nearshore waters of the Florida Keys, defined as from the shoreline to the seaward edge of Hawk Channel, generally experience high variability in temperature, salinity and other factors relative to the reef tract further offshore. Differences in circulation and the physical and chemical characteristics of water in the Florida Keys reflect exchange processes between Florida Bay and the Atlantic Ocean, the influence of the Florida Current, and wind-driven currents in Hawk Channel. Nearshore waters in the upper Florida Keys are generally well-flushed and dominated by seagrasses, large sandy shoals (e.g., White Banks), and large patch reef areas (e.g., Mosquito Bank). They are not as significantly influenced by Florida Bay because of the larger sizes of islands and the absence of larger tidal passes in the northern Keys. The nearshore environment of the middle Florida Keys is characterized by significant exchange of water between Florida Bay and the Atlantic Ocean. The sea bottom in areas adjacent to tidal channels consists of seagrasses, bare sand, low-relief hard-bottom communities, and patch reefs. Nearshore waters in the lower Florida Keys are influenced by exchange of water between the eastern Gulf of Mexico and Atlantic Ocean. Bottom or benthic habitats consist mostly of seagrass and bare sand, low-relief hard bottom, and abundant nearshore and mid-channel patch reefs. With the exception of nutrient variability from upwelling events, offshore waters of the Florida Keys are relatively stable in terms of some water quality parameters compared to nearshore areas, particularly temperature, salinity, and dissolved oxygen. Distinct gradients can occur in circulation patterns and water residence time from the upper to lower Florida Keys. The offshore environment of the upper Florida Keys is relatively well-circulated, and dominated by Florida Current circulation (Klein and Orlando 1994). The upper Florida Keys area has the most robust reef development, most likely due to the warm-water influence of the Florida Current coupled with the lack of water exchange with Florida Bay. The offshore waters of the middle Florida Keys exchange with Florida Bay via tidal channels, thus reef development is relatively poor. The offshore waters of the lower Florida Keys are influenced by wind-driven circulation in Hawk Channel and offshore gyres (or smaller circular currents) of the Florida Current. The offshore waters of the lower Florida Keys have a significantly longer residence time than other offshore areas. This has considerable implications for nekton, plankton, and larval transport in these areas. In the offshore environment of the lower Florida Keys, there is moderate bank reef development, with several well-developed bank reefs (e.g., Sand Key, Eastern Sambo) and patch reef areas (Jaap 1984). Indigenous peoples have long resided throughout the Florida peninsula and on the surrounding islands. The southernmost regions of Florida, including the Florida Keys, were dominated by the Tequesta and the Calusa tribes, who arrived in the region about 7,000 years ago, probably from northeast Florida (Carr 1991). These Native Americans depended on the sea for almost everything they needed, subsisting on fish, turtle, crabs, clams, lobster, and mollusks (Tilmant 1989). The bountiful marine resources in the Florida Keys provided a cultural subsistence tradition that remained unchanged for at least 4,000 years, until European contact served to eliminate the Native American population, mostly through disease (Carr 1991). The first confirmed European contact with the Keys was made in 1513 by Ponce de Leon of Spain, while exploring the Florida Straits (Wells 1991). In 1519, the Spanish established Havana, Cuba, and by the mid-1500s and throughout the 1600s, they colonized Florida. In 1763, the Spanish ceded Florida to the British in a trade for the port of Havana. The treaty was unclear as to the status of the Florida Keys. An agent of the king of Spain claimed that the islands, rich in fish, turtles and mahogany for shipbuilding, were part of Cuba, fearing that the English might build fortresses and dominate the shipping lanes. The British also realized the treaty was ambiguous, but declared that the Keys should be occupied and defended as part of Florida. Although the British claim was never officially contested, ironically, the British gave the islands back to Spain in 1783 in order to keep them from the newly formed United States. In 1821, however, all of Florida, including the Florida Keys, officially became American territory, followed by formal statehood in 1845. The 20th century brought major changes to the Florida Keys in terms of transportation and residential and commercial infrastructure. In the early 1900s, travel between many of these islands was only possible by boat. However, this changed in the 1890s when Henry Flagler, president of the Florida East Coast Railway, brought the Overseas Railroad down Florida's east coast to Miami. The railroad was later extended to Key West in 1912 (Parks 1968). On Labor Day 1935, a hurricane struck the upper Florida Keys and permanently destroyed the railroad. The railroad's right-of-way was then sold and rebuilt into the Overseas Highway, which opened in 1938. This replacement road, which includes more than 40 bridges connecting the islands, eliminated the ferry rides and narrow wooden bridges of the first highway, making the Florida Keys more accessible from the Florida mainland (Marzyck 1991). Between 1938 and the early 1980s, vehicles traveled down the Keys on a narrow two-lane roadway that was built on top of the old railroad bridges. The narrow Overseas Highway restricted or deterred the movement of wide vehicles to some extent. Large recreational vehicles, camper trailers, and wide boats seldom ventured south of the upper Keys. Several events occurred in the early 1980s that permanently changed the infrastructure and subsequently the economy of the Keys. First was the construction of wider bridges from Key Largo to Key West. Additionally, the roadway was widened to allow passage of supply trucks and the safe transit of recreational vehicles, camper trailers, and wide boats. Along with the bridges came a larger water pipeline that supplied the Keys with fresh water from the well-fields in Florida City and a new electrical line to supply dependable power throughout the islands. Another benchmark of change came when the Monroe County Tourist Development Council was created in 1982, which is currently funded through a "bed tax." A portion of this bed tax was and remains dedicated to advertising to attract more visitors to the Keys. From 2002 to 2009, the total revenue from the bed tax fluctuated between $14 million and $15.5 million. The peak was 2005 at $15.5 million but declined to $14.1 million in 2009. Development of the islands outside of Key West began slowly in the 1940s and boomed from the 1950s to 1990s, thus allowing for a significant growth in population (Figure 3). The population of Monroe County rose from 17,114 in 1900 to 78,024 by 1990. The population increased more slowly between 1990 and 2000 and was 79,589 by 2000. However, the population has been steadily declining in Monroe County since 2000 and as of July 1, 2009, the population is estimated at 73,165 (U.S. Census Bureau 2010). Since 1995, the Florida Keys have lost over 500 campsites because those lands were sold to developers to build condominiums. In addition, several hotels have been converted to condominiums. We hypothesize that this change in development pattern will change the goods and services and recreational activities in which people participate. We further hypothesize that the changes will be towards less natural resource-dependent and water-based activities than those chosen by people who stayed in campsites. Population growth in and development of Monroe County have been driven largely by the tourism industry, but also the Florida Keys as a place for retirement, commercial fisheries, the military, and the upper part of the Keys as a "bedroom community"1 for South Florida. These are referred to by economists as "basic industries" as they bring new dollars into the community, which then have ripple effects on the rest of the economy. These industries are discussed further in the "Commerce" section below. Five primary factors influence population growth and land development in Monroe County: 1) the tourism industry; 2) Florida as a retirement destination; 3) the commercial fishing industry; 4) the military; and 5) the "bedroom community" nature, particularly in the upper Keys due to their proximity to Miami-Dade and Broward counties. These factors each bring dollars into the Florida Keys community, which then have multiplier impacts on the rest of the economy. Florida's coral reefs are located near the four most densely populated counties of the state. The combined population of these counties is over 5.6 million, with 1.2 million in Palm Beach, 1.77 million in Broward, 2.5 million in Miami-Dade, and 73,200 in Monroe (Figure 3; U.S. Census Bureau 2010). The next largest industry is the retirement and "bedroom community" nature of the Florida Keys. Over 50% of the income received by Monroe County residents is not related to work in Monroe County; retirement income in the form of social security and pensions make up most of this income. The commercial fishery industry also has a significant impact on the Florida Keys economy. The economic impact of this industry is great, representing close to 5% of the Monroe County economy in terms of output and sales and close to 9% of employment. In 1994, the total economic contribution of the commercial fishery industry to the Monroe County economy was estimated (CEMR 1995, Leeworthy 1995), with revenue from fisheries landings in at approximately $56.5 million (1994 $). This revenue can then be converted to total impacts generated through the wholesale, processing, retail, restaurant, and export markets to have a total economic impact in Monroe County of $92.2 million in sales, $58.2 million in income and supported 4,130 jobs (1994). The military is also a major industry in Monroe County, with the U.S. Navy located in Key West. Until September 2001, the Navy was down-sizing its operations in Key West and giving up properties for other development. For example, the sanctuary's Key West office and Eco-Discovery Center are both located on a small portion of former Navy property (Truman Annex), which was transferred to NOAA during this down-sizing operation. In 1995, the military directly contributed $81.6 million in income to Monroe County and supported 2,028 employees. In 2007, the direct income received by military personnel increased to $147.66 million, but the number of employees declined to 1,670. The military directly accounts for about 7% of Monroe County's income by place of work and in 2007 accounted directly for 2.9% of employment (U.S. Bureau of Economic Analysis 2010). In 1989, mounting threats to the health and ecological future of the coral reef ecosystem in the Florida Keys prompted Congress to take action to further protect this fragile natural resource. The threat of oil drilling off the Florida Keys in the mid-1980s, in combination with reports of deteriorating water quality throughout the region, the die-off of the long-spined sea urchin (Diadema antillarum), loss of living coral cover on reefs, a major seagrass die-off, declines in reef fish populations, and the spread of coral diseases, were topics of major scientific concern and the focus of several scientific workshops. While these scientific pursuits were underway, three large ships (M/V Elpis, M/V Alec Owen Maitland and Mavro Vetranic) ran aground on the coral reef tract within an 18-day timeframe in fall 1989. These cumulative events of environmental degradation that prompted Congress to designate the 2,800 square-nautical-mile (9,603 square-kilometer)Florida Keys National Marine Sanctuary on Nov. 16, 1990, in order to expand the scale of resource protection beyond the existing Key Largo and Looe Key national marine sanctuaries; these two smaller sanctuaries then became a type of marine zone (Existing Management Areas) within the larger sanctuary. This was the first national marine sanctuary to completely surround a community. TER North - adjacent to Dry Tortugas National Park, comprises 90 square nautical miles (309 square kilometers) of ocean habitat, and contains relatively extensive areas of spectacular deeper (>50 feet or 15 meters) coral reef formations in the Florida Keys. TER North incorporated 54 square nautical miles (186 square kilometers) of existing sanctuary area and added 36 square nautical miles (123 square kilometers) to the original boundary by "squaring off" the northwestern corner. TER South - located to the southwest of Dry Tortugas National Park, comprises 60 square nautical miles (205 square kilometers) of ocean and includes the critical fish spawning grounds of Riley's Hump. The TER expanded the boundary of the sanctuary from 2,800 to 2,896 square nautical miles (9,603 to 9,933 square kilometers) in 2001(Figure 5). The boundaries of the sanctuary encompass numerous habitats and structural zones (Figure 6). Benthic habitats include unconsolidated sediments (e.g., sand and mud), mangrove, submerged aquatic vegetation (e.g., seagrass and algae), coral reefs and colonized hard-bottom habitats (e.g., spur and groove reefs, individual and aggregated patch reefs, and gorgonian-colonized pavement), and uncolonized hard bottom (e.g., reef rubble). 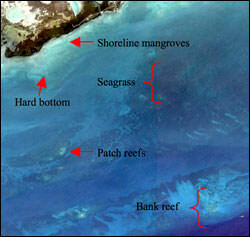 Some of the major habitat types of the Florida Keys are shown in Figure 6, starting with fringing mangrove or sandy shorelines, progressing through nearshore seagrass and hard-bottom habitat, to mid-channel and offshore seagrass beds and patch reefs, and finally to the offshore bank reef system. 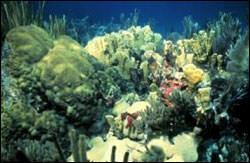 Typical coral reef structural zones include the back reef, reef flat, reef crest, and fore reef. 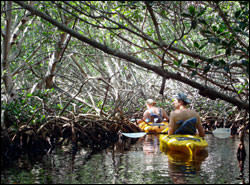 Florida's estimated 496,000 acres (200,724 hectares) of mangrove forests contribute to the overall health of the state's southern coastal zone (Figure 7). Red mangrove (Rhizophora mangle) trees fringe much of the 1,700 islands and 1,815 miles of shoreline within the sanctuary, and they are a vital component of the Florida Keys ecosystem. In the abiotic realm, mangroves act as important wave attenuation barriers for all points landward, buffering the action of waves and storm surges associated with both frontal and tropical storms. Thus, they provide important shoreline protection services in the Florida Keys, as in all coastal locations where they occur. They also assist in trapping and cycling various organic materials, chemical elements and important nutrients throughout the interconnected reef-seagrass-mangrove system. Mangrove forests play an important role in the carbon cycle by removing CO2 from the atmosphere and storing it as carbon in plant materials and soils in a process called sequestration. Layers of soil and peat that make up the mangrove substrate have a high carbon content, and when they are disturbed or removed, carbon is released into the atmosphere. In addition, mangrove roots provide attachment surfaces for various marine organisms, especially on their partially submerged prop roots. Many of these attached organisms filter water and, in turn, trap and cycle nutrients. The relationship between mangroves and their associated marine life cannot be overemphasized. Mangroves provide protected nursery areas for young fishes, crustaceans, shellfish and other invertebrates (Drew and Eggleston 2008). Many of these species are food for a multitude of fish species such as snapper, jack, snook (Centropomus undecimalis), tarpon (Megalops atlanticus), sheepshead (Archosargus probatocephalus), and red drum (Sciaenops ocellatus). Florida's important recreational and commercial fisheries will decline without healthy mangrove forests to support them. Many animals find shelter either in the roots or canopies of mangroves. Mangrove tree canopies serve as rookeries, or nesting areas, for coastal birds such as brown pelicans (Pelecanus occidentalis) and roseate spoonbills (Platalea ajaja). The Florida Keys ecosystem includes one of the world's largest seagrass beds, which are among the richest, most productive, and most important submerged coastal habitats. Seagrasses are flowering plants that live in the ocean (Figure 8). Like land plants, seagrasses utilize carbon dioxide and produce oxygen. Seagrass occurs throughout the soft-bottom, shallow-water areas of the sanctuary wherever water quality is sufficient to allow light penetration to the seafloor to enable photosynthesis. Like mangroves, seagrasses also serve important ecosystem functions, often acting as a kind of "link in the chain" between the reef and mangrove systems, both spatially and in terms of food webs (Valentine et al. 2008). Likewise, seagrass meadows also perform certain coastline services such as stabilizing the bottom with their roots and rhizomes in much the same way that land grasses retard soil erosion, and maintaining water clarity by trapping fine sediments and other particles in their leaves and root system. Like mangroves, seagrasses sequester carbon. 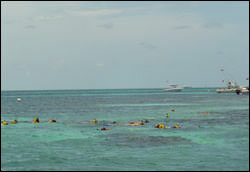 They also offer habitat and protection for many fishes and invertebrates, crustaceans (such as lobster and shrimp), and shellfish; provide food for marine animals including green sea turtles (Chelonia mydas), West Indian manatee (Trichechus manatus), parrotfishes, and sea urchins; and serve as a nursery area for recreationally and commercially important marine life (Rudnick et al. 2005, Acosta et al. 2007). 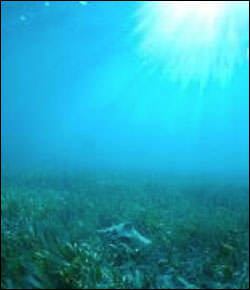 The Florida Keys ecosystem includes five species of seagrasses, with turtle grass (Thalassia testudinum), manatee grass (Syringodium filiforme), and shoal grass (Halodule wrightii) making up most of the coverage of seagrass beds in the sanctuary (NOAA 1996, 2007). Data from the sanctuary's Water Quality Protection Program indicates approximately 4,942 square miles (12,800 square kilometers) of seagrass beds lie within and adjacent to the sanctuary. Monitoring of benthic communities by the National Undersea Research Center(NURC) and the University of North Carolina at Wilmington has documented that species of simple plants classified as algae dominate many benthic habitats throughout the sanctuary (NOAA 2007). Due to their ability to grow in the marine environment, fleshy macroalgae are commonly referred to as "seaweeds." Turf algae often form dense, lettuce-like patches on dead coral or other rocky bottoms. There are three basic types depending on the color of the photosynthetic pigments that predominate: green, red, and brown. Like land-based "weeds," seaweeds grow faster when they are fertilized and tend to grow rapidly when they are not grazed by sea urchins or fish, just as land plants in a pasture might grow when they are not grazed by cattle or sheep. To a major extent, macroalgae compete with coral for living space on the seafloor, but it is important to note that macroalgae are a common and natural component of every coral reef system. Like other plants, it is a food source for a number of reef-dwelling animals, especially sea urchins and certain reef fishes such as surgeonfishes and parrotfishes. Typically, it is only when the ecological balance of a reef is upset (e.g., by widespread coral mortality from bleaching or disease) that it tends to become overgrown by the rapidly growing macroalgae (Maliao et al. 2008). The Florida Reef Tract is the most extensive living coral reef ecosystem in North American waters and the third-largest barrier reef in the world. Coral reefs are created by calcareous marine algae, reef-building corals, and other marine invertebrates that produce skeletons or structures made of calcium carbonate (CaCO3, or limestone). The skeletons of corals and other marine life combine to form a rigid, wave-resistant structure called a reef. An individual coral animal, called a polyp, resembles a miniature sea anemone just a few millimeters in size. Like anemones, a coral polyp is soft-bodied, tubular, and topped by a ring of tentacles. Unlike an anemone, a reef-building coral polyp builds a hard external skeleton that forms a protective cup, or calice, around its base, creating a corallite. Hundreds to thousands of coral polyps together make up a reef-building coral colony. Each polyp is connected to the next by a thin layer of tissue, creating a living mat over a shared skeleton. Colonies grow by progressively building more and more skeletal mass. Within the tissue of most reef-building corals live small microscopic algae called zooxanthellae. These algae produce energy and oxygen for the coral as byproducts of photosynthesis. Some coral species are predominantly reliant on this energy source, whereas other species are less reliant on the photosynthetic byproducts and acquire their most of their energy by suspension feeding. Zooxanthellae also aid in calcium carbonate production by the coral colony, promoting the growth of coral skeletons. Coral reefs generally are restricted to the tropics, where waters are generally warm, clear, low in nutrients like nitrogen and phosphorus, and have stable temperature and salinity. The Florida Reef Tract is one example in which the warm waters of the Florida Current and Gulf Stream expand the range of corals north of the tropics (Figure 9). Coral reefs create important habitat for various organisms including both sessile and mobile invertebrates, as well as highly diverse reef fish. In turn, many of these animals provide food for predators that often visit reefs, such as sharks, sea turtles and dolphins. Similar to mangroves and seagrasses, corals also perform vital coastal shoreline services. For example, coral reefs can protect a coastline from wave action, storm surges, and even tsunamis (Cochard et al. 2008). The Florida peninsula and the Florida Keys archipelago serve as a biogeographic transition zone between the warm-temperate waters of the Gulf of Mexico and the adjacent tropical to subtropical waters of the Atlantic Ocean. This division has resulted in a distribution of marine fauna and flora characterized as having both a warm-temperate and tropical Caribbean component (NOAA 1996). The following section contains general descriptions of select taxa, but a complete list of the marine and terrestrial species found in Florida Keys National Marine Sanctuary can be found at http://floridakeys.noaa.gov/scipublications/speciesList.pdf (Levy et al. 1996). Invertebrates in the sanctuary are highly diverse. Resident phyla include, but are not limited to, Cnidaria (corals, sea anemones, jellyfish), Platyhelminthes (flatworms), Porifera (sponges), Annelida (segmented worms), Arthropoda (crustaceans), Ectoprocta (bryozoans), Mollusca (bivalves and snails), Echinodermata (sea stars, sea urchins and sea cucumbers). With the exception of a few "fishery ' crustaceans (e.g., shrimp, lobster, stone crab), the ecological roles of many of these invertebrates are not well understood and continue to be studied (Levy et al. 1996). Porifera (sponges) are important components of coral reef ecosystems, and some species grow quite large, often more than three feet (one meter) in height. Besides filtering large amounts of water, sponges in nearshore hard-bottom habitat are critical shelter habitat for a myriad of obligate and opportunistic invertebrates and fish such as crabs, shrimps and brittle stars (McMurray et al. 2008). In the Keys, there is even a certain genus of sponge (Cliona) that serves as an aggressive coral bioeroder, thus providing a key process in a reef's carbonate budget. This genus has been on the increase in recent years, and several of its members are now among the dominant sponge species in the Florida Keys (Keller and Donahue 2006, Chiappone et al. 2007). Caribbean spiny lobsters (Panulirus argus) are one of the Florida Keys' most economically important commercial fisheries, and the Florida Keys stock is heavily exploited by both the commercial fishery and by recreational divers and snorkelers. Between the two fisheries, a large percentage of the available adult population is removed each year (Cox and Hunt 2005). Sea urchins, more specifically the long-spined sea urchin (Diadema antillarum), were historically one of the most important invertebrate grazers on coral reefs in the Florida Keys, helping control the abundance of algae. Though in some parts of the Caribbean the long-spined sea urchin played a major role in controlling algal biomass (Levitan 1988), the roles of both piscine herbivores and sea urchins in controlling algal dominance on coral reefs are still being discovered (Furman and Heck 2008). Because of the Florida Keys' connection to adjacent aquatic environments, a variety of different fish assemblages rely on sanctuary resources for all, or part of, their life history. Whether fishes are estuarine, demersal, or pelagic, their species richness is correlated with temporal and seasonal influences. Historic long-term studies, using both visual and consumptive sampling techniques, yielded between 389 and 440 total fish species (Longley and Hildebrand 1941, Starck 1968). The Florida Keys host more than 285 species of birds, many of which are seabird or shorebird species. Birds most frequently encountered in and around the water include terns, gulls, plovers, cormorants, pelicans, herons, egrets, osprey (Pandion haliaetus) and the Magnificent Frigatebird (Fregata magnificens). The Florida Keys are also an important stop-over point for other migratory birds and waterfowl. The Florida Keys and the sanctuary are within the seasonal geographic range of a variety of marine mammals. Thirteen species of whales, seven species of dolphins and the West Indian manatee either reside in or travel through the sanctuary at some point in their lifetimes. A variety of plants, invertebrates, fishes, reptiles, birds, and mammals that use or contribute to sanctuary resources in the Florida Keys are protected at the federal or state level. Each of these species is a valuable natural resource that contributes to the ecological balance of the sanctuary. Animal species at risk are dependent on the sanctuary's diverse habitats, including mangroves, beaches (below high water mark), seagrass beds, and coral reefs. State and federally threatened and endangered marine and aquatic fauna include, but are not limited to, elkhorn coral (Acropora palmata), staghorn coral (A. cervicornis), pillar coral (Dendrogyra cylindrus), all five species of sea turtles found in the western Atlantic - loggerhead, green, hawksbill (Eretmochelys imbricata), Kemp's Ridley (Lepidochelys kempii), and leatherback - the American alligator (Alligator mississippiensis), American crocodile (Crocodylus acutus), smalltooth sawfish (Pristis pectinata), Roseate Tern (Sterna dougallii), Least Tern (Sterna antillarum), and the West Indian manatee. The sanctuary is also in the migratory range of three species of whales: humpback (Megaptera novaeangliae), fin (Balaenoptera physalus), and North Atlantic right (Eubalaena glacialis). 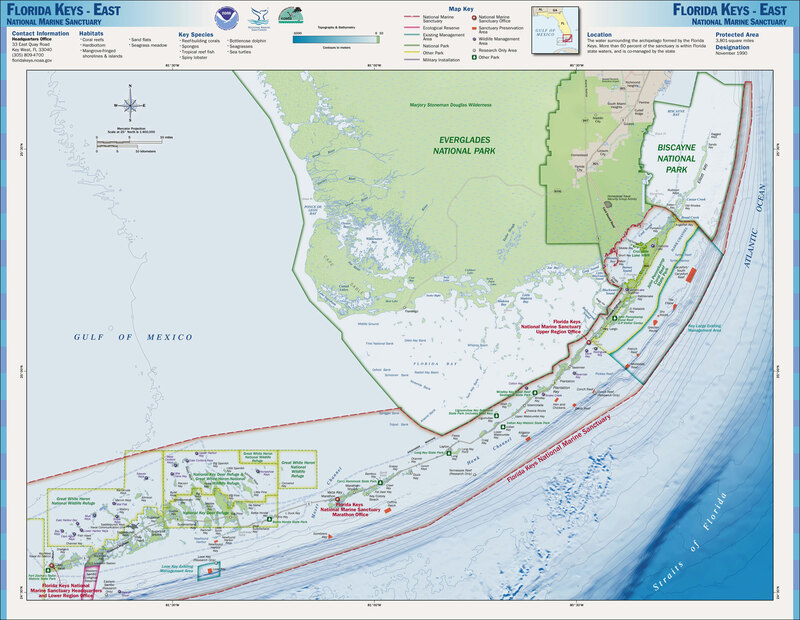 Florida Keys National Marine Sanctuary is the trustee for maritime heritage resources located within its boundaries (Figure 10). Maritime heritage resources are defined as those possessing historical, cultural, archaeological, or paleontological significance. The sanctuary's maritime archaeological resources are unique, non-renewable remnants of the area's colorful maritime and submerged prehistoric past and include hundreds of documented shipwreck sites and artifacts, cultural remains of early peoples and historical activities, railroad remnants, and historical offshore structures. The sanctuary's maritime archaeological resources encompass a broad historical range from the European Colonial Period to the Modern Era. 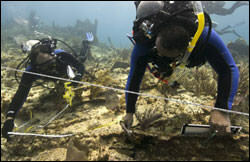 Because of its unique geographical position on the European and American trade routes, shipwrecks in the Keys contain a record of the 500-year history of the Americas. An estimated 2,000 shipwrecks are thought to have occurred in the Florida Keys since European exploration of the Western Hemisphere. Approximately 669 historic artificial reefs have been documented to date (Halas 1988). Currently, 14 shipwrecks and two lighthouses within the sanctuary are listed in the National Register of Historic Places. Key West has been the crossroads of the Caribbean since the colonial era, and the sea has remained the common thread through the region's culture and history. The importance of the region's maritime heritage resources is great, and the possibility exists for discovering some of the earliest archaeological sites in North America. A detailed description of the cultural and historical resources of the Florida Keys is contained in the "Description of the Affected Environment," of the Environmental Impact Statement (NOAA 1996). 1Bedroom community refers to the people who live in the Florida Keys/Monroe County but commute to work outside the Florida Keys/Monroe County area. 2An important concept for planning for growth management that is a result "basic industry" drivers is the "functional population." The "functional population" is the number of people in the Florida Keys on an average or peak day. This is the relevant population for growth management planning since it is the number of people that require housing, water, sewage, electric, transportation and other infrastructure services. In the Florida Keys the "peak" functional population is also used for planning hurricane evacuation, which is a limiting factor in the growth of the Monroe County population. 3As a share of the total Monroe County economy, recreating visitors in 2007 to 2008 accounted for about the same share of output/sales as 1995 to 1996 (60.5% in 1995 to 1996 and 59.9% in 2007 to 2008), a slight increase in income received by place of work (45% in 1995 to 1996 and 46.9% in 2007 to 2008), and a significant increase in employment (46.5% in 1995 to 1996 and 57% in 2007 to 2008).